A detailed look at what to expect from Deere & Company in 2015. The recent second-quarter earnings from Deere & Company (NYSE:DE) helped the stock to outperform the S&P 500 on a year-to-date basis. The stock has attracted a lot of attention in 2015, not least from the news that Warren Buffett has been buying it for Berkshire Hathaway. How did the recent results reflect upon the company's prospects in 2015? Let's take a look at four key conclusions. Why was earnings guidance raised? First, Deere's management cheered investors by increasing its full-year forecast for net income to $1.9 billion from a previous forecast of $1.8 billion. However, don't get too excited about calling a bottom in the agricultural sector just yet. In reality, the guidance hike -- which occurred despite increased headwinds from a strengthening U.S. dollar -- was mainly due to an increase in cost savings rather than an increase in revenue estimations. For example, selling, administrative, and general expense costs are now expected to be down 11% in 2015 versus a previous estimate for a 9% reduction. With regard to revenue, management expects full-year net sales to be down 19% rather than a previous forecast for a 17% decline. Moreover, even on a currency-adjusted basis, Deere now expects full-year sales to fall 15% versus a previous forecast of a 14% decline. The chart below breaks out how the full-year 2015 forecasts have changed in the last three quarters. As you can see, expectations for full-year sales growth have gotten worse in both equipment operations, but financial services income expectations are higher. Source: Deere & Company presentation. All Sales growth figures are currency-adjusted. Second, despite falling sales and a weak end market, Deere managed to increase equipment prices by 2% in the second quarter, a figure in-line with the company's forecast for 2% price realization in 2015. 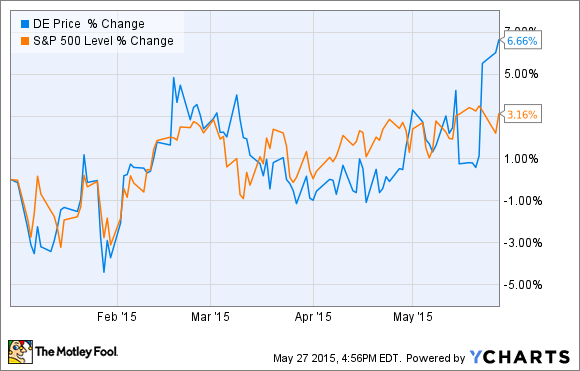 Moreover, Deere appears to be managing its inventory position better than its rivals. When answering a question from Morgan Stanley analyst Nicole DeBlase on the subject of pricing, Deere's Director of Investor Relations Tony Huegel talked about Deere's agricultural equipment: "Inventory levels are, as a percent of sales, about half of what the rest of the industry would be. But certainly that puts pressure because those inventories need to come down, and so you do see some pricing pressure." Third, management affirmed its belief that, given the possibility of poorer crop-growing weather, crop prices could move higher. Higher prices for crops like corn, wheat, soybean, and cotton are key for Deere because they imply higher income for farmers, which usually translates into more spending on agricultural machinery. On the earnings call, Deere's Manager of Investor Communications Susan Karlix described the global grain stocks-to-use ratios as being at "somewhat sensitive" levels. She went on to argue: "Unfavorable growing conditions in any key region of the world as well as unknown impacts from any geopolitical tensions could lower production, reduce stocks-to-use ratio, and result in prices quickly moving higher." Indeed, if we get poorer crop-growing weather, you can expect Deere's stock price to move higher as the market prices in better expectations for the stock. 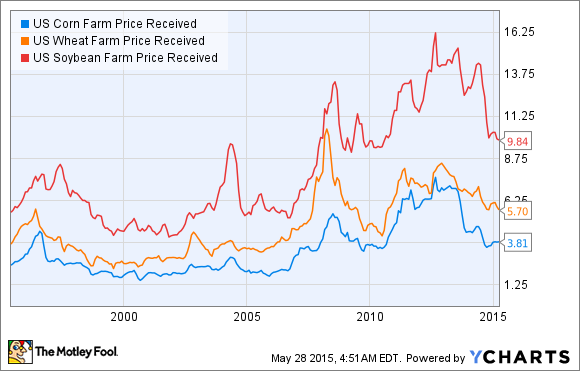 The following chart demonstrates how key crop prices have fallen in the last few years. Fourth, on a less positive note, Deere appears to be facing increased risk due to the expansion of its leasing operations. When Deere leases equipment rather than selling it outright, it runs the risk of creating a glut of used equipment that could create pricing pressure for its used and new equipment sales. Deere needs to make sure that it values the equipment properly in order to avoid having to take a future hit. We tend to be relatively conservative on the setting of residual values. We continue to do that. Today, we certainly evaluate those on a regular basis. We haven't had any kind of writedowns or accruals that we've had to make against the residual values of that leasing portfolio. But that's really where the risk is. In other words, Huegel is acknowledging the increased risk that comes with leasing. It's something to look out for, particularly if the end-market outlook worsens, and industry pricing comes under further pressure. The hike in earnings guidance is good news, but it's not coming from an improvement in the industry outlook. Deere is doing a good job of managing costs and inventory levels, but risk is rising due to the increase in leasing activity. Ultimately, Deere's stock price is likely to move around based on sentiment about movements in farmers' incomes, and that usually requires crop prices to go higher. Don't get too excited by these results, but the company is executing well in a difficult environment.